Cupcake heads! Photo by Erin Stone. 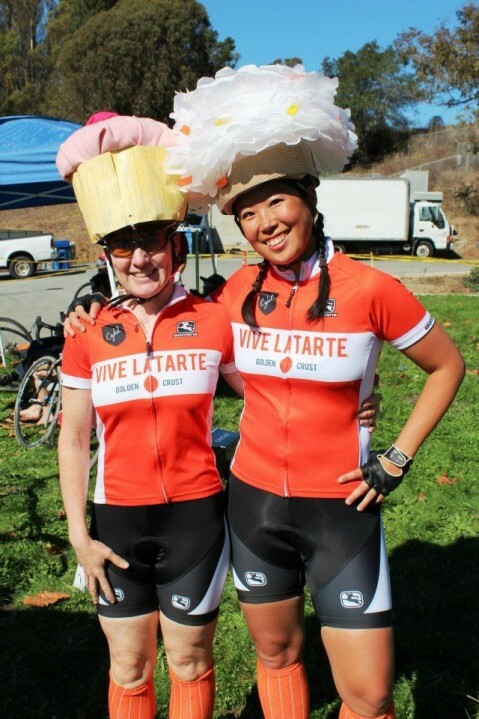 My teammate Bridget and I dressed up as cupcakes (she was strawberry-flavored, I was coconut) in honor of vive le tarte, a Belgian pastry catering company based in SF that co-sponsors our team. As we were planning on skipping the costume race, we decided to just wear them during our main race — which probably wasn’t the wisest decision. Cupcake heads are definitely not recommended if you’re doing a challenging course like Aptos. Filled with gravel, sand, steep stairs and a 1000 ft. descent of narrow singletrack that bombs you into a sand pit (described as ‘treacherous’ by the organizers) — the course definitely posed some challenges to us as we wore our heavy, non-aero headgear. I knew this race was gonna be gnarly — especially after a fellow B’s woman hit the pavement hard within the first 20 seconds of the race and I had to quickly hit the brakes to avoid steamrolling over her. I decided to employ some strategic tactics to survive until the end. Step 2: Stay upright. I didn’t want to crash on the steep singletrack or in the hairpin turns coming in and out of them. So I stuck my leg out and used it to pivot when necessary. While they weren’t the most graceful maneuvers – and my friend Hans was coaching me to keep my weight back and stay off the front brake instead of skidding through the turns – I managed to avoid crashing. Unfortunately, the course claimed some victims and there were quite a few yard sales today. I’m happy to have emerged unscathed. Step 3: Slow and steady finishes the race. Today was probably the hardest race I’ve ever done and it certainly was my slowest. I was lapped by several elite women and passed by my teammate Laura (who placed second today in her C’s race and has been killing it all season). But I was motivated to keep going with all of the “Go, Cupcake!” cheers that greeted me at every turn. And finishing is better than DNF and makes the post-race beer taste even better.